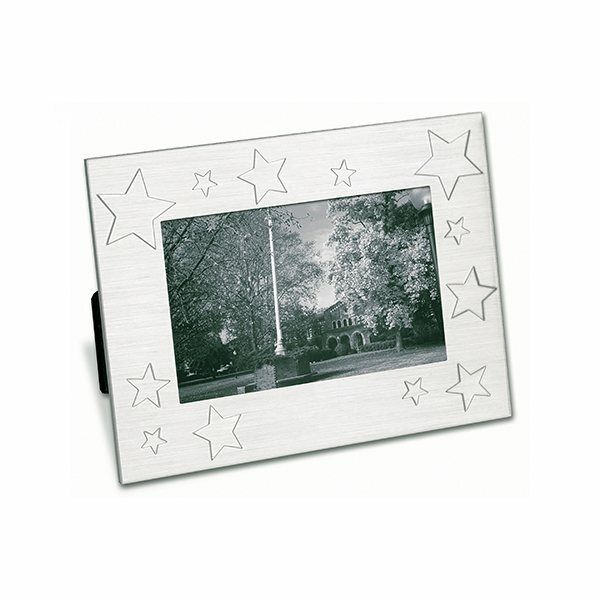 4" x 6" (horizontal or vertical) photo frame with embossed and debossed stars. Brushed aluminum with black felt backing and glass front. Window opening: 5 1/8w x 3 1/8"h.
Insert size: 7 3/8"w x 5 3/8"h.
This was exactly what we purchased. We will be tossing these out at our event. It will be so great. We are impressed with the help and service along the way. That factors into getting a great product with confidence. Thank you. Product pretty good as well as customer service! the Logo was very clear and the size was better than I expected. Everyone liked them. We have planned to give them out as souveniers to all the participants at our workshop. the product was great for the budget I was alotted. there is nothing we liked "least" about either product!